It is 8.30am and team Lipstick waits at the office of the barge operator to arrive in order to proceed to the crossing of the Congo River. Patience is not the strength of team Lipstick and the red wine of the night before did not improve this weakness at all but eventually at 10am the man in charge drove ahead of Lipstick to the harbour. Red wine is really not to be used for patience improvement…….. Eventually by 12 noon Lipstick was airborne with its 4 tyres being attached to 4 ropes being attached to a crane which most probably was constructed the same year as the Eifel tower of Paris. Lipstick landed on the barge which must have shared the same birthday with the Eifel tower and the crane and the team proceeded to the boat which was to pull and push Lipstick over the Congo River. It became obvious that there are more goods being transported from DR Congo to Congo then the other way round because the push boat hooked up another empty barge and one fully loaded barge (loaded with onions potatoes and other goods) and eventually the push boat started to push 3 barges across towards Kinshasa over the Congo river which in this part of the world is already some 5km wide…. There are 2 main harbours in Kinshasa with the main one mainly for goods and the other one mainly for cars and passengers. 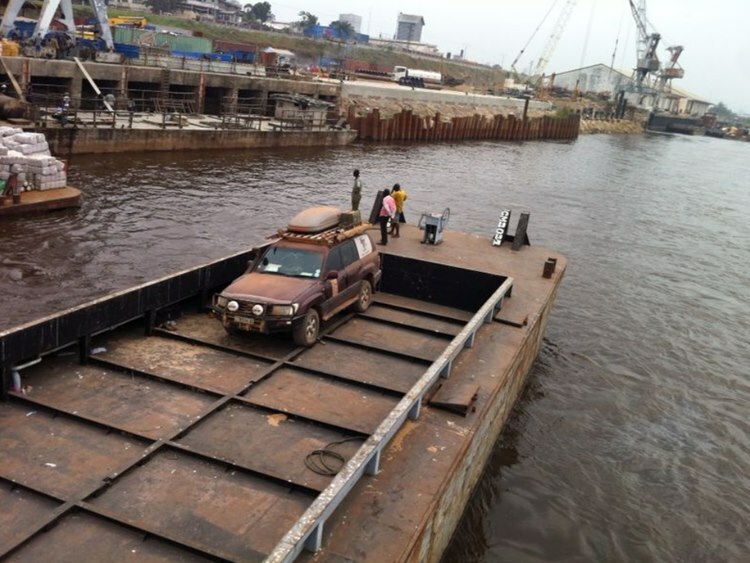 In his wisdom the captain of the barge thought it would be best to first dock the empty barge and the fully loaded barge at the main harbour before pushing Lipstick barge to the other harbour from where other cars would be brought back to the Congo. 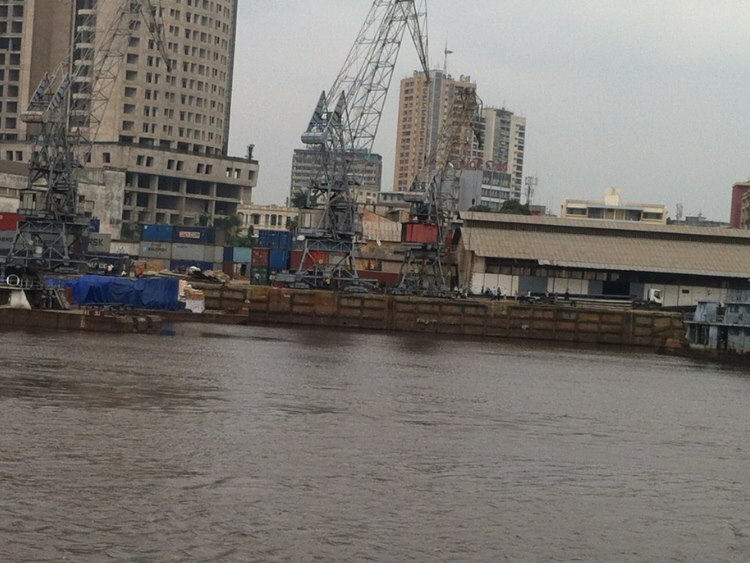 So Lipsticks barge was unhooked onto other barges and then the fully loaded barge was pushed towards a crane position in the Kinshasa harbour where hundreds of labourers where keenly awaiting the possibility of getting a job to offload the barge. Whilst the loaded barge was busy being tied down a group of men arrived on the push boat and all of a sudden chaos seemed to prevail. 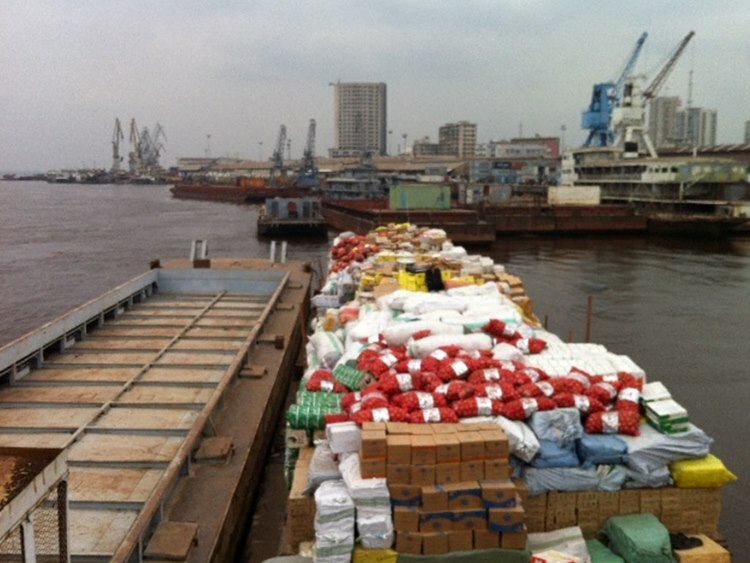 Accompanied by 4 men in civil clothing and 2 uniformed and gun carrying individual’s team Lipsticks climbed off the push boat and up the steps on the docking wall of the Kinshasa harbour leaving Lipstick behind on the barge. Off to an office in one of the harbour buildings which the Belgian government must have put up during the time of the installations of the Eifel tower in Paris and through narrow gangways with fences all around. There the team were offered seats and questioned about the where from and where to and how it can be possible that a German can obtain a visa for the great DRC in |Pretoria South Africa. Luckily Will had his South African Identity document available proofing his place of permanent residence to be South Africa. Officer 1 now studied the SA identity document in great detail before deciding that this was too much for his current ranking in the DRC police force and deciding to phone his head office. Up and out of the office where in the hall the team met a group of 4 armed blue uniformed officers surrounded by the officers from the rotten welcome office and in the middle the sun glass wearing Gaddafi look alike Chief Commander of the DRC Immigration department. Page by page the commander looked through the team’s passports every now and then looking at the smiling team to check whether their face matches the passports pictures. My name is Mr Ntsusi my officers will accompany you through immigration I wish you bon voyage. Thank you Mr Ntsusi we are sooooo happy to be in your country. Now the team follows a member of welcome office 1 to his car who would take them to the immigration office at the port for passengers coming from Congo. The team at this stage does not know where Lipstick is currently. 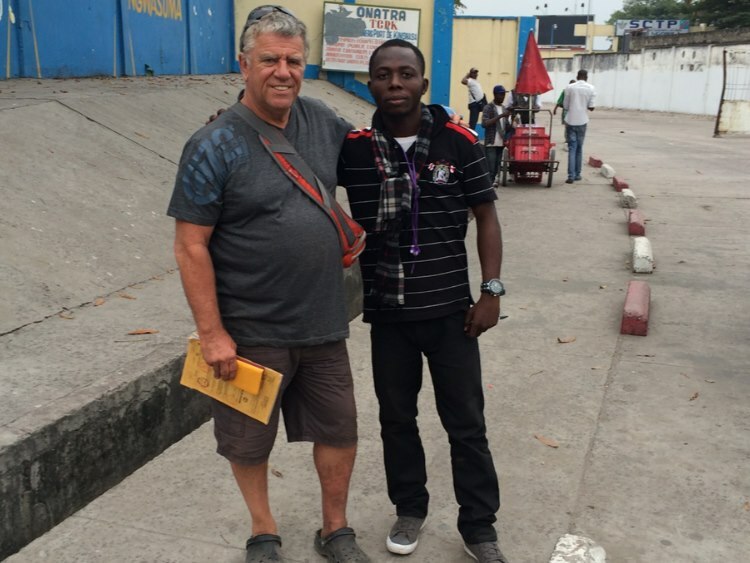 He calls a few fellow officers to push start the car which would not start in 2 attempts causing Andre to get out the car and assists the pushing team whilst Willy enjoys being pushed by Andre onto the streets of the DRC. Eventually the car started and the team arrived at the other harbour being greeted by extremely friendly officials who by now seem to have received orders by Chief Ntsusi and the passports were stamped in no time ate all where after another officer assisted the team to proceed through customs. By that time the team met a young DR Congo guy who could speak good English and he was now appointed secretary to team Lipstick translating every bit of Congo French to English. 6 offices later the team was guided towards the docking side of harbour 2 and with great relief Lipstick was spotted on the barge waiting to be lifted off. 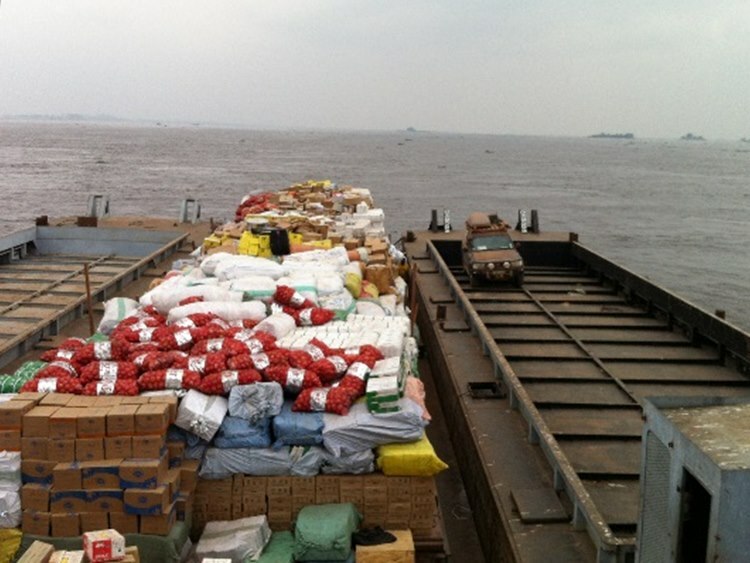 There were about 10 Mercedes Benz ML cars waiting for Lipstick to get off the barge so that they can be loaded onto a trip to Brazzaville where the French speaking edition of Forbes magazine wants to host its 3rd edition of its annual economic forum. So in fact Lipstick took part in this event by holding the luxury cars up from being transported to Brazzaville where they would transport some 9 heads of state. Maybe this was part of the thorough immigration procedures team Lipstick had to go through. 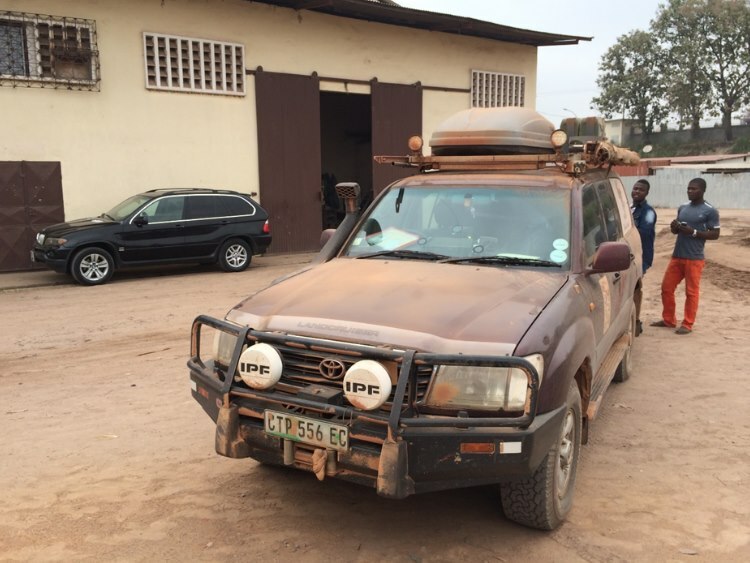 Finally all stamps were in its proper place and Lipsticks made it out of Kinshasa through dense traffic on the way to Matadi – the border Town between DRC and Angola. Again the day light came to an end but the option of staying in Kinshasa against driving through the night towards Matadi was decided in favour of the night drive. Having started at 8.30am in Brazzaville the team eventually arrived in Matadi around Midnight finding a place of rest at the Ledea Motel.